In this episode, you will learn about how the Bronx is growing into a global tourism destination in its own right. Olga Luz Tirado is the executive director of the Bronx Tourism Council, a division of the Bronx overall economic development corporation. In this capacity, she plays a significant role in creating a cohesive and symbiotic relationship between arts, culture and economic development while rebranding the Bronx, its rich history, institutions and diversity to a local, national and global audience. Since joining the BTC in 2012, Olga has developed and implemented a comprehensive and integrated marketing strategy by incorporating design thinking methodology into the overall planning process. She has spearheaded a successful campaign to increase the borough’s exposure within international travel guides, media and tour operators, utilizing a variety of marketing channels, including aggressive public relations outreach, van tours, digital content development and social media. Within one year of her appointment, tourism in the borough increased 14%. She serves as the official spokesperson of tourism for the borough, appearing on the cover of the August 2012 issue of Crane’s New York Business, and has been interviewed by various top-tier national and overseas broadcast, digital and print media. Olga is the recipient of several awards, and was most recently named one of the top 25 influencers in the Bronx by City and State Magazine. Thank you for joining me, Olga. I’m so happy to be here, Nicole. Thank you for the invitation. Could you share a little bit more about your story and share with our listeners in your own words how you got to where you are today? Well, you know, I am a born and bred New Yorker. And my background, professionally, is in marketing. Prior to being here, I owned my own public relations marketing and special event management company. I was representing a multitude of clients from a variety of industries, including beverage, tech, and also tourism. I actually came to my current position as I was hired to consult to manage an annual weeklong festival called Bronx Week. And at the time, I had been running my business for quite a number of years. And as many people who own businesses, and particularly marketing businesses, when you lose an anchor client or a huge client, it can, you know, sort of wreak havoc. And so at the time, I took on this position as a consultant. And when I was offered the job to head the tourism council, I thought well, that would be a new adventure for me. And it has been for the past five years. I think that’s really exciting and I’m looking forward to hearing your perspective on our subjects on this show today. The first area we like to focus on is creativity. And the second area is collaboration. So starting with creativity: Understanding how competitive the tourism and hospitality industry is, I’m wondering what you have done to help the Bronx stand out from the crowd. Well, when I started here, one of the first items on my agenda was to get to know who the movers and the shakers were, the institutions, the attractions or the would-be attractions in the borough. Rather than coming up for a vision of where the agency was heading myself, I wanted to hear about what the stakeholders wanted to see differences in terms of increasing their audience numbers, and also what they were doing within their own outreach efforts. So, one of the first things I did was to meet with the big three that really anchor the Bronx as a tourism destination. And that’s of course Yankee Stadium, the Bronx Zoo, and the New York Botanical Garden. But I also met with some of the hidden gems, the smaller institutions, the galleries, the historic homes, the museums, the tour guides. And we had long sessions where we would just chat and chat and chat about what they thought their challenges were, what worked for them, what didn’t. That’s fantastic – what were the next steps? Armed with this information and some ideas of my own, I treated this agency, I treated the Bronx Tourism Council as a business. I decided to actually approach it as if it was a business. So I drafted a business plan, filled with a mission and vision, goals, objectives, short-range and long-range plans, and a marketing strategy. With that, I identified and created a few target audience profiles. And, I came up with seven. And the seven included, the first one was the citizen. The citizen was the Bronxite who had no idea what was in their own backyard. The second target audience profile was the neighbor. The neighbor is Westchester County, Connecticut, New Jersey, the other boroughs. And these are people that may or may not have come to the Bronx to visit and take advantage of some of the attractions that we have here. The third is the house guest. The house guest is the person who comes to visit the citizen or the neighbor and is looking for new ideas and places to go and visit. The repeat customer is another target audience profile. These are the people who come to New York, over and over, for business, or they have family here, or they know and they’re looking for a new experience other than going to the Empire State Building or other things like that. So that gives you a sense of how I was targeting the demographics. And I’ll have to say that I put together a five-year plan, and I think I accomplished about 90% in the first year that I had wanted to accomplish in five years. And that’s due in part to the fact that, you know, we had a lot of, we had a good relationship with a lot of our cultural partners. It seems to me getting that five-year plan accomplished so quickly is in part based on those relationships and kind of that listening tour that you did before you even started to create the plan and vision of where you were going. Would you agree with that? Yes, absolutely, absolutely. You know, when I came in, I wanted to make some big changes. My whole passion was to make a huge impact. But I didn’t want to come in and have local institutions feel that I was coming in to do something to them. It was more than I was doing something for them and with them. And I enjoy an incredible relationship with a lot of these smaller institutions that have grown as a result. Fantastic. The other thing I love which is so interesting is that you decided to approach your organization as a business and that you drafted this business plan. So, I am wondering, as you were approaching this new role and starting to execute on your plan, what were some of the first types of marketing or creative steps that you took? Well, you know, one of the things that we did is we were very, very heavily involved with NYC and Company which is the destination marketing organization for New York City. And they were one of the groups I met with and made it clear that we were open for business and ready to meet with travel journalists and travel companies. We did that, and as a result, we got increased exposure in some of the travel publications from all over the world. And so we did that, and just as one example, we met with the publisher of a travel book out of the Netherlands. And they’re looking to really feature the Bronx very prominently in their next book. 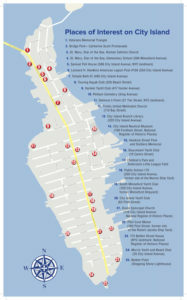 I also created a Bronx visitor guide, which never existed before. And it’s an annual guide. You can find a copy of it on ilovethebronx.com. And so, what we did is we printed a couple of guides, a pocket-sized 4×9. But also, we created a digital publication. So anyone from anywhere can just go on and read it, right online. And we’ve done this with many of our publications. I’ve also introduced seasonal fun guides that allow our cultural institutions to send us a list of the things that they’re doing, and it’s in one big schedule. So we’ll have people able to go online and take a look and see, gee, what’s happening in the Bronx next week? And they can get that from the fun guide. Oh, those are some excellent steps. Thanks! It’s important for us to evolve with the times. When I started in 2012, we had a database for email. And we had about 3,000 emails and we would send these blast emails to them. I have a subscriber base now of 30,000. Much of that has to do with, of course, the events that we do. We do a lot of annual events here, and people participate and they sign up and so we capture those emails. But also, we’re getting people who are opting in because they want to know what’s going on. So we have an e-newsletter now called Go Bronx. And in there, I send it periodically. There’s no real schedule. It’s when we have something to say. Like, I might send something today because it’s President’s Day weekend, so it’s a long weekend. Well, if you’re looking for something to do, these are the things that are going on in the borough during the weekend. But, you know, I mean going from 3,000 to 30,000 is pretty significant. Great. Backing up just a bit – I’m interested – because you have NYC and Co as your kind of overarching DMO, correct? So you, in all of the boroughs, work together and collectively? Each of the boroughs structure things a bit differently. The Bronx Tourism Council is its own agency. The other, Brooklyn for example, it’s their chamber of commerce that has a division within it to do tourism. And it’s particularly in some of the smaller places throughout New York State. I find that the chamber of commerce does take on that responsibility of increasing tourism in their area. Particularly, I’ve seen that in other states like Vermont. And the others, in Queens and Staten Island, it’s a division of the office of the borough president. So though we are, we work very closely with the office of the borough president, we are a separate entity from that government institution. So, it’s structured a little bit differently, but we do come together and throw out ideas and have a little friendly competition. You know, and we have some fun with it. That was another one of my focuses when I started, was let’s make friends everywhere. That’s a good motto. Well, that leads me to another question. I always like to hear from our guests about a challenge or some adversity because challenges often put us into that creative mode. So I’m wondering if you can share a challenge that you might face, and maybe some creative solutions that might have come from that? Yes. And that’s the challenge that I’ve had to deal with. And even when I told people that I was leaving my business to head up the Bronx tourism council, some people actually laughed. Like, why does the Bronx have a tourism council? There’s nothing in the Bronx. So, how I answered that was I began to develop compelling stories, tours, nautical tours that took people to City Island, which we call our own little Nantucket in the Bronx. A tour called Mansions and Cottages, Historic Homes and Gardens of the Bronx. Another tour called Breweries and Distilleries, not only providing tastings of craft beverages and artisanal beers that are being created here in the Bronx, but also a history of brewing in the borough, which dates back to the late 1800’s when German immigrants came here. We started to make people aware of the fact that the Bronx is the birthplace of hip-hop. We have the largest urban zoo in the United States, with over 6,000 exotic animals. We have Woodlawn Cemetery, which is a historic landmark, with many notables interred there. And by the way, mausoleums that are architectural wonders and some bigger than my apartment. And the cemetery gives tours. We taught people that the Grand Concourse, our boulevard, which was designed by a French architect. It has the second largest conglomeration of deco architecture rivaled only by South Beach, Florida. And each tour I noticed that I was able to identify a few participants that fit into one of my target profiles. The citizen, Bronxite’s who were born and raised here and they were astounded what was in their own backyard. This is the Bronx? Yes, you’re in the Bronx. The neighbor, from other boroughs or Westchester County, the Hudson Valley, New Jersey, Connecticut, who had no idea what the borough has to offer. This is the Bronx? You know, yeah, you’re in the Bronx. Even that prodigal child, someone who once lived here and came back to visit. They see what has changed, they’re like, whoa, I’m in the Bronx. And by the way, I actually use that tagline. Yes, you’re in the Bronx. The Bronx is where Edgar Allen Poe lived, it’s where Mark Twain also once lived. As I said before, it’s the birthplace of hip-hop, it’s the birthplace of doo-wop. If you ever remember listening to Dion and the Belmonts, they came from the Bronx. I love what you did in terms of putting those stories together, creating those tours, aligning those tours with your audience profiles that you had developed. And really changing perceptions. I think that that’s just really awesome. Well, yes. And we’re still growing in terms of the things that we’re doing. There are some institutions that are also expanding their tourism outreach. I mentioned Woodlawn Cemetery before. Because they also are a historic landmark, they are creating these wonderful tours there which they’re expanding on. The illuminated mausoleums, where people take lanterns and do a walking tour in the cemetery. They have a little jazz section. Max Roach, Miles Davis, Duke Ellington, are interred there and so they give these jazz tours as well. So, many of the institutions where they weren’t really thinking too much about actually creating a tourism opportunity, are now thinking outside of the box. And they’re saying, how do we bring more people here and make them more aware of some of the things that are happening? Wave Hill, for example, which is this gorgeous garden. 28 acres along the Hudson River. They’re doing the sunset Wednesday’s event, which on Wednesday nights, they have these little concerts. And every August, I created this salsa fest, which is the celebration of the music. And I’m Puerto Rican myself and I was actually born dancing salsa because that’s what you’re supposed to do when you’re Puerto Rican. So we do these salsa fest activities throughout the borough throughout the month of August. And Wave Hills has dedicated one night of their sunset Wednesdays for salsa music. That’s all really awesome! So, looking into the future, is there a project in the works that you’re really excited about that you’d like to share? Yeah, well, we want to expand, we also have this other thing called the Bronx Walk of Fame where we induct sons and daughters of the Bronx onto the Grand Concourse. And their names go up on our lamp posts. And we have quite a few very well-known people. Stanley Kubrick, Mary Higgins Clark. We’ve got a few people that we’ve inducted. But that’s pretty exciting. They love it. One of the things that we’re doing is, we’re sort of rebranding the Grand Concourse as more than just, you know, this long, four-mile boulevard. We’re trying to rebrand it as the Walk of Fame. The Bronx Walk of Fame. So, people can come and take pictures of, you know, signs with their heroes and stuff like that. But that’s the next step. And there’s always something stirring around in this little brain of mine. So, we’ve got a few things yet to accomplish before I’m done. Fantastic. I know we’ve talked collaboration a bit, but Is there a time when a collaboration has worked especially well for you and could you share how that worked? One example that comes to mind – We partnered with the Bronx County Historical Society, to help get our facts straight when we do these tours. Is this true? When did this happen? Was it in 1865 or was it in 1866? Do you have any background information on this? And some of our tours actually are designed with their input to ensure that authenticity. So, when we say that the Van Courtlin House is the oldest house in the Bronx, built in 1748, we’re making that claim based on verified information. You know, I don’t want to turn the Bronx into photo ops with Mickey Mouse, because Mickey Mouse has nothing to do with the Bronx. So, leave that for Time Square. So, we design our own tours, but we also help to guide and promote other tour guides. And again, sometimes they think they’re in competition with each other, but they’re not really. Because the way I look at it, the more the merrier. All I want is for you to give accurate and authentic information. So, we give them information or refer them to the historical society. Well, I knew this would be a fascinating conversation. But before we wrap up, do you have any final words of advice for our listeners as it pertains to partnerships and collaborations? Anything that might be like a best practice or pearl of wisdom that you’ve learned along the way? Well, you know, I think what I would say is, look for a shared goal. You know? Whenever you want to partner with another group or institution, just make sure that if you can just focus on what the shared goal is, that’s what’s going to make the difference in terms of the partnership. You know, as I said, for me, for the institutions here in the Bronx, the shared goal was to get more people through their doors. And I was able to do that because we made sure that we took people from one to the other to the other. And they had the ability to tell their story. And you know this as a marketer, it’s all about telling a story, right? So, each one of them were able to tell their story to the group of people that we were bringing there. So, the shared goal was to bring in more foot traffic to their places. So they weren’t competing, they were really just, as I said, telling their story. And as a result, word of mouth, people will tell other people who will tell other people who will tell other people, this is the place to go.